Note: there is a large list of the monuments in Granada here. The Alhambra is the red fortress which sits on the hill overlooking Granada and covers an area of approximately 140,000m². 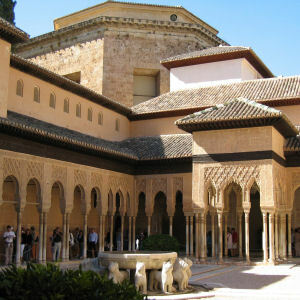 It is the most visited monument in Spain and most people who travel to Granada will visit it. If you have bought general entrance tickets, you should probably set aside an entire morning or afternoon to see it. There are bars, cafés and restaurants in the grounds of the monument in case you want to have something to eat or drink. The impressive cathedral took around 180 years to build and was finished in 1704. You can see the tombs of the Catholic Monarchs Isabel and Fernando, King Felipe and Queen Juana in the Royal Chapel. 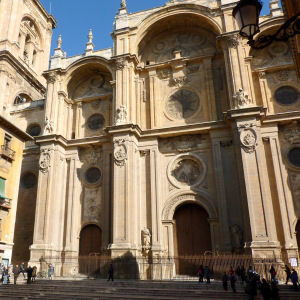 Both the Cathedral and the Royal Chapel are in the centre of Granada so you can combine your visit with shopping (Calle Recogidas, Calle Mesones, etc.) or a walk around the city centre, taking in the Coral de Carbon, Plaza Bib Rambla, Plaza Nueva.